Here in the Dales Water office we’re very passionate about groundwater; with all of our team taking a keen interest in the protection, management, quality and the correct utilisation of one of the most valuable resources we have. 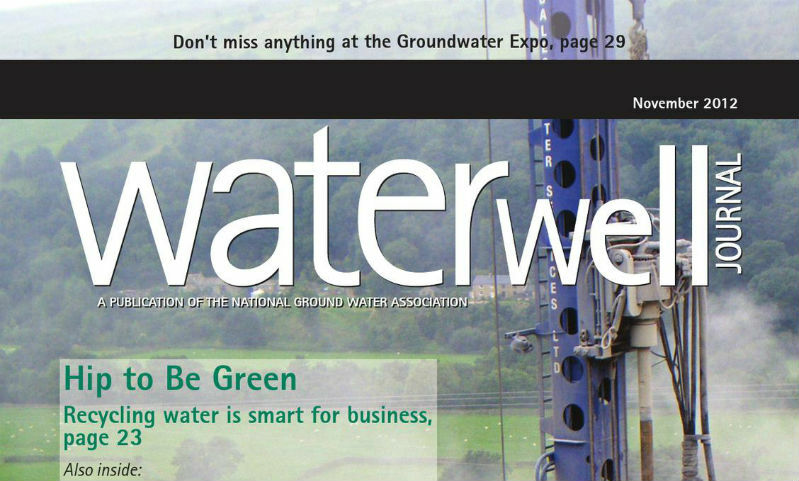 Because of our enthusiasm and desire to keep abreast with all the latest news surrounding groundwater across the world we receive and read various industry related magazines. The best one that we have delivered is the Water Well Journal which is produced by the National Groundwater Association (NGWA) in the USA. As we’re members of the NGWA we have been in correspondence with them from time to time and we recently supplied some photography and details of our work for their interest. To our surprise we found ourselves on the front cover of the latest issue! (November). As you can see in the picture above one of our rigs drilling a borehole at a site in North Yorkshire was chosen as the cover image. We were also featured in the editorial section on page 5 and on the inside back cover (page 76) as part of the regular “Closing Time” feature. Included in that is more information about our sites and our company as a whole. Getting featured in our favourite publication is fantastic and we’d like to pay a big thanks to the Water Well Journal for including us! You can take a look through the magazine embedded below and you’ll see our pictures and information. If you’d like to find out more about us, the utilisation of groundwater or borehole drilling feel free to contact us.